At Phylway we enjoy what we do, and it shows – in our people and in our work. Our personnel take great pride in their work and gain true satisfaction in getting the job done right – and our history of completed work reflects that attitude. We have regularly met the challenges of many ambitious projects. These projects have been entrusted to us because we listen, because we care, because we work diligently to deliver a quality product on time and within budget – and because we make it happen for our customers. We have all the experience and expertise needed to find different and better approaches to achieve the proper solution for any project. Phylway lays the groundwork that provides a solid foundation for communities and businesses. 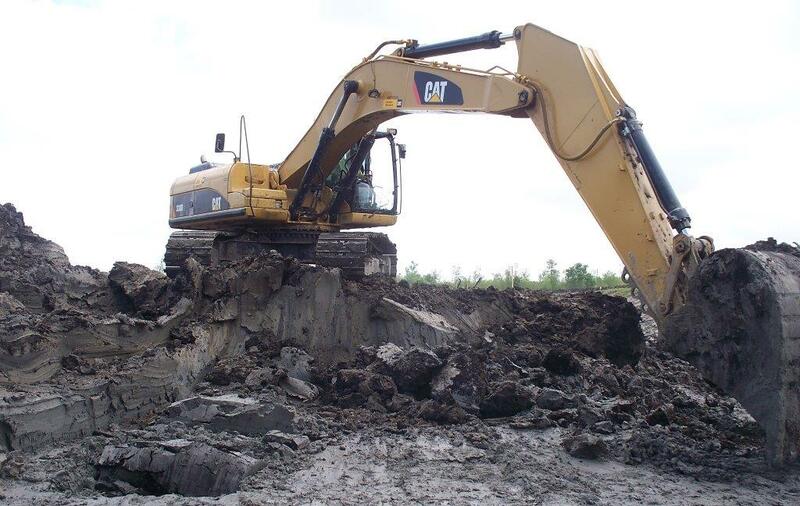 We construct the levees that protect life and property from the ever-present threat of rising water. We install the distribution systems of water, sewer, gas and storm drainage that keep your community up and running. We build the roads and bridge the waterways to help you safely reach your destination. In addition, our concern for a safer, healthier environment is emphasized throughout the entire construction process. We utilize inovative technology and equipment, both on and off site, to help minimize cost and maximize productivity – those two prime objectives shared mutually by contractor and owner alike. It’s all part of our commitment to meeting the ultimate objective at Phylway – customer satisfaction. Committed to the philosophy of “working smarter, not harder”, Phyllis Adams entered the construction business in 1992 with one dump truck, a few thousand dollars, a father who was a self-made success in the construction business – and a fear of failure that proved to be her greatest motivator. Immersing herself in the dump truck business, Phyllis quickly recognized that many of her fellow truckers had difficulty juggling the business side of trucking while actually driving ten to twelve hours a day. Sensing a promising niche, she began as a business manager for those truckers – locating and scheduling work for them, invoicing their clients, collecting their receivables, and sending them a paycheck every week. Her idea soon caught on and Phylway was off and running. When Hurricane Andrew wreaked havoc across South Louisiana, Phyllis poured her efforts into the clean-up phase in the wake of the storm, acquiring additional equipment and expanding her operation. She used that same equipment to make the transition into a few small water and sewer contracts once the clean-up had been accomplished – and the diversification of her business was underway. Gradually, as the contracts began to get larger, it was only natural that Phyllis would follow her father’s footsteps into highway and heavy construction – and Phylway Construction has continued to grow and prosper ever since. Phylway Construction recognizes the importance of protecting the privacy of all information provided by users of Phylway Construction and our related Web sites. We created the following policy guidelines with a fundamental respect for our users’ right to privacy to guide our relationships with our users. Phylway Construction will not reveal any personal information that users provide to us to any third party without their permission. Phylway Construction uses users IP addresses to help diagnose problems with our server and to administer our Web site. We also use it to gather broad demographic information about our users in general. This information does not contain anything that can identify users personally. We may combine demographic information supplied by a subscriber at registration with site usage data to provide profiles, in aggregate form, about our users and their preferences in the content of the site. We may share this composite information with our advertisers to help them better understand our services, but Phylway Construction does not give advertisers information about individual users of Phylway Construction. Upon request, Phylway Construction will remove users (and their information) from our database or permit them to opt-out of any further e-mail newsletters or contact. Special restrictions on a visitor’s license to access this site apply to non-human visitors. “Non-human visitors” include, but are not limited to, web spiders, bots, indexers, robots, crawlers, or harvesters. Such non-human visitors are restricted from taxing the resources of this website or any service it provides beyond what would be typical of a human visitor. Because of their potential for abuse, in consideration for access to the site, non-human visitors are required to read and observe the industry-standard restrictions as set forth in the robots.txt file included at the root level of every domain governed by this agreement. The restrictions provided for in this file shall be considered an addendum to this agreement when applicable to non-human visitors. The robots.txt file specifies restrictions to the directories non-human visitors may access. Non-human visitors accessing directories beyond what is allowed by the robots.txt file is recognized by the parties to this agreement as trespass and expressly prohibited. Furthermore, as specified by the “no-email-collection” flag in the header of every web page and the robots.txt file, email addresses on this site are considered proprietary intellectual property of the author of this website. It is recognized that these email addresses are provided for human visitors alone, and have value in part because they are only accessible to said human visitors. Intentional collection, harvesting, gathering, or otherwise storing email addresses by non-human visitors is recognized under this agreement as theft or diminution of value of intellectual property and expressly prohibited. Phylway Construction is not responsible for the content or the privacy polices of Web sites to which it may provide links or the Web sites of its advertisers or clients. Phylway Construction uses reasonable precautions to keep the personal information disclosed to us secure and to disclose such information only to responsible third parties after permission from the user.